Are you tired of spending thirty dollars a month on a gym membership and not having the time to go? Well you can bring the experience of the gym to your home with adjustable dumbbells.But how do you know which ones are right for you? 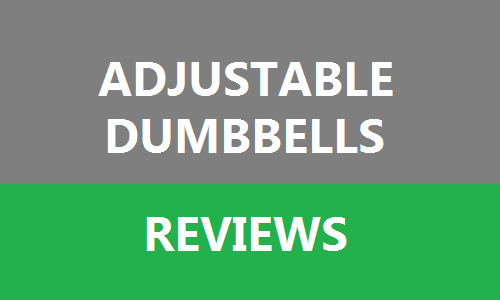 There are so many different kinds of adjustable dumbbells out there that it is hard to make a decision. They have to give you the right workout, they have to be simple to use, and an even better plus, at a low cost. With the help of this guide you will have the information to help you make a great selection on which type of dumbbells is right for you. 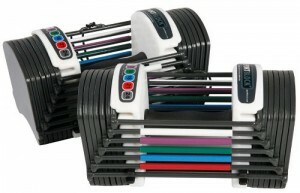 The Bayou Fitness Pair Adjustable Dumbbells is one of our top competitors. Made of a heavy-duty chrome plated metal the Bayou Fitness Pair has a high durability. The solid metal body may be great for long time use but it is rough on the hands. I recommend buying gloves when considering the Bayou Fitness Pair so not to rough up your delicate hands.Coming in with a whopping thirteen inch handle it has one of the smaller handles out of all five mentioned in this article. Even with a smaller handle it maybe awkwardly big on the sides.This set is a dial system. You can set each side to what weight you would like and then begin your workout.Its weight ranges from five to fifty pounds and goes up in five pound increments and has nine different weight settings. With a strong adjustment mechanism this competitor has less of a chance of the weights falling out. At least if they fall out they won’t damage your floors.The only damage these may do is to your wallet. It may come with a one year warranty but the Bayou Fitness Pair is one of the most durable and reliable sets although it has one of the higher prices. On the other end of the spectrum is the Universal Power-Pak 445. The Power-Pak comes Equipped with a stand, a workout guide, and thermoplastic rubber handles for a non-slip grip. Plus the setup is fairly simple. Just set it and go; again we see the dial system with this dumbbell set. Weighing in at four to forty-five pounds the range of weight on this set is on the smaller side.Yes this may be smaller on the weight scale but not on the size scale. The stand is ergonomically designed to hold all the weights at once but it is not designed for a tight fit. The weights tend to move around when you’re moving them but they stay when being lifted.Overall the Universal PowerBlock Pak 445 is a great choice. Even better yet it comes with a one year warranty. Next on our list is the PowerBlock SportBlock 2.4. This product is great for small apartments because it is the size of a shoebox this comes in as our smallest adjustable dumbbell. A downfall of its small size is its light weight capacity. Weighing in with three to twenty-four pounds per hand it adjust in three pound increments.Trainers love this because it can meet a wide variety of difficulty levels. You can easily and quickly adjust the weight although the pin can be quite tricky along with the fact that the magnets could be stronger. If not used on a hard surfaced floor you may have an issue with the pin staying in the correct place.You will not have an issue with your hands staying in place. The handles are padded and contoured in the middle so you can have a comfortable workout. This is by far the easiest to store and the easiest on your hands. Plus it is the easiest to replace with a ten year warranty. This is among one of the lowest priced dumbbell set in our list. Does money have you in a tight spot? The Cast Iron dumbbell comes in at our lowest priced set. But you get what you pay for. There is no case included and many people complain that when you take them out of the box they give off an unpleasant odor. The all metal handles can hurt your hands compared to one of the padded options. Also chipping paint was among one of the top complaints. Although they can give off a bad appearance they are simple to use. What is included? With this type of dumbbell it is as simple as selecting which plate you want, slide it onto the threaded handle, and thread the collar on the end. The collars are tight and stay in place very well. 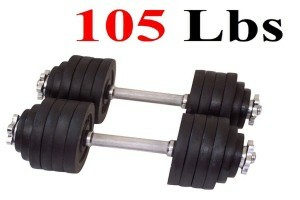 You may save more money with the Cast Iron adjustable dumbbells but cheaper is not always better. 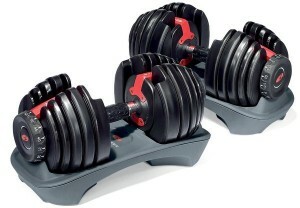 By far the best adjustable dumbbells sets out there is the Bowflex SelectTech 552. The simple dial system makes your workout easy to switch from beginner to advanced. Let us say you select twenty pounds, the system will select exactly twenty pounds and leave all the other weights in the holding base. The only problem that happens every so often is that a little bit of shifting can prevent the plates to lock into place but if jiggled a little bit then it will lock back to the right place.What is even better about this is that the molding around the metal plates keeps them tightly and safely in place. Even though the plates are kept in place safely you do not want to drop these on the floor. They are very sensitive because they have plastic pieces. The positive side with the Bowflex SelectTech 552 comes with a two year warranty on both the parts and the metal plates.With a weight range of 5 to 52.5 pounds this set can be used for both beginners and advanced workout fanatics. This uses increments of 2.5 pounds up to the first 25 pounds, then they go up in increments of 5 pounds. There are 15 different sets of weight combined into one system which makes storage very simple and easy. There are only three things that are not so great about this dumbbell. First they are longer than the standard dumbbells which can make doing the most simple of exercises a little bit of a hassle. Secondly, to make them last longer you would want to buy the BowFlex SelectTech stand which can cost you a little extra. 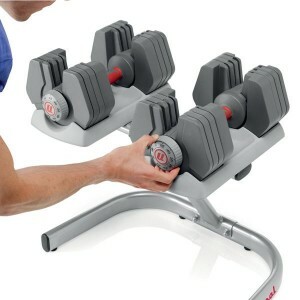 Other than those implications the BowFlex SelectTech 552 adjustable dumbbell set is the way to go. 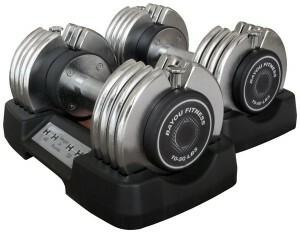 There are two different types of dumbbells you have the option of purchasing: Fixed-weight and adjustable. Whether you want an intense workout or just an easy relaxing workout; which if you want to relax why would you lift heavy objects? An adjustable set gives you a much wider range of weights compared to a fixed-weight.There are many perks to having an adjustable compared to a fixed-weight set. Money and space are probably the most important when it comes to having an at home gym. Let’s be honest, money is the first thing on everyone’s mind.You may have to spend more money buying ten different fixed-weight dumbbells compared to just one adjustable. With an adjustable set you can change the weight anywhere from five to fifty pounds whereas with a fixed-weight set you have to buy each weight individually.Having twenty different fixed-weight sets will take up much more space in your house than one adjustable set. With an adjustable set you can hide it away in a closet with ease but when you have to buy twenty different fixed-weight sets you have to be able to make room for forty different items in one place. Maybe it is under the bed…I’m sure if I spread out that many objects I’m bound to forget where I put them all.There are some at home objects you can use instead of a dumbbells. Take a milk-jug for example; I wouldn’t want my milk out of the fridge that long in the first place but hey that is your call on the taste of spoiled milk. When the milk jug is empty you can fill them with either sand or water for a similar effect to dumbbells. What is the difference between protein powder and a protein shake? They both do their job of giving you a boost of protein to your day although one is pre-made and one you have the choice of what you mix in with it. The same principal is applied to dumbbells.As stated earlier there are two different kinds of dumbbells; fixed-weight and adjustable. Then you have your at home creations but that is why there called “at home” and not sold for the average person’s use. A fixed-weight dumbbell comes in two different shapes; round or hex. A round-shaped dumbbell has more give to it than a hex-shaped one. The hex-shape is welded together as one piece whereas the round-shape is broken into pieces. If one of these said pieces were to break you can replace them; you cannot replace the correct welding job with a hex-shape. Something else you will not be able to replace is the feeling of blisters breaking out on your skin.Fixed-weight dumbbells also come with three different types coatings; rubber, natural rubber, and urethane. And if you’re allergic to latex, ready the EpiPen® before every workout with any type of natural-rubber coating. The rubber coating is either completely encasing the steel or just covering the ends of your dumbbell. If you like to work out in the sun be careful because the rubber can become faded with access to UV light.I’m not worried about the fading color I’m worried about the marks these will leave on my floor if I were to drop them. Dropping a heavy object on the floor may damage your floor in general but with a urethane coating your floors are more protected from scuffs and dents. They also have a higher wear and tear quality than the rubber coating does. When it comes to how much we can lift that is up to ourselves to figure out. 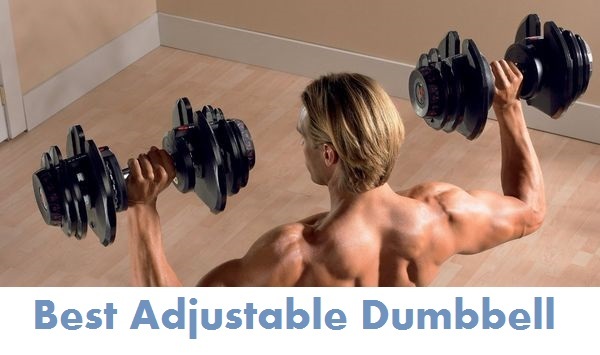 Being able to adjust your weight to just how you like it is made much easier with adjustable dumbbells. There are four different types of adjustable sets; the dial system, handles, the slide system, and the stacked system.They are all similar but are used differently. The dial system works by turning a dial on the end of the dumbbell to the weight you want and then it will correctly adjust itself. The slide system works similar to the dial system except you have to slide the adjustment knob to the weight you want and it will pick up the amount you choose.Unlike the slide or the dial system the handles type of dumbbell comes with different weights on either side. To use all you have to do is pull off what weight you do not want, and once you’ve decided how much you can lift, you put the threaded handle on the end of each side and lock it into place.And finally the stacked system. With this system each weight is stacked inside each other. To use all you have to do is take out the selector pin and put it where you want it so that when you lift up all the weight above the selector pin will also lift up. This seems too good to be true, working out made simple and easy? Yes and all it takes is a little adjustment. Choosing between all these different types of systems can be the tricky part about completing you’re at home gym experience. There are many factors that play into getting the right kind of adjustable for you. Money, size, style, and what is included with each set can make or break the deal. Again money plays a big role in choosing which one is best for you. Sets can range anywhere from low hundreds to mid hundreds. Depending on what type of system you choose will also be incorporated in the price range.A dial or slide system runs a higher price than say the stacked or handle system but you also get more for your money. A slide or dial system usually comes with nine weight settings, is 15″ long by 8″ wide by 9″ long, and goes up in increments of five. Whereas a stacked or handled system comes with between 6 and 9 settings, are normally 10″ long by 5″ wide by 6″ tall, and go up in between 3 and 5 increments.All sets vary in size but adjustable-weights are easier to store than fixed-weights. Normally they come with either a base or a stand to put your weights back into. These make easy storage because you can store them all in the same place with no hassle to move other things around.As stated in Adjust Your Muscles the type of style you choose will also have an effect on what is best for you. Whether you want to just turn a dial or tighten a threaded handle it is what is more convenient to you the user. What also what makes things more convenient for the user is that most adjustable sets come with a how-to-video and a guide on how to have a healthier workout. It’s better to spend the money and actually use it then pay for a gym membership and not go. You are now informed on how to make a better selection on what type of adjustable set is right for you. Not only are they simple to use but with them being right in your house you do not have to make time to go to the gym. On your down time instead of picking up the remote pick up the weight set. All you have to do is select your weight and start lifting. When your friends say have you been going to the gym you can tell them no I work out in my own house. No need to wait for a trip to town, a healthier you is just a click away.